This correctional facility in Inuvik was designed as a rehabilitation place for female young offenders. Its extreme northern latitude (above the Arctic Circle), combined with the fact that in the winter there are 24 hours of darkness, provided a challenge to the architects in deciding how to minimize energy costs and consumption. The territorial Department of Justice, who administers the building, was proactive in their desire to use renewable technology on their buildings. The result was a hybrid, 800 ft2 (75 m2) SolarWall® system that was designed to preheat both ventilation air and water. 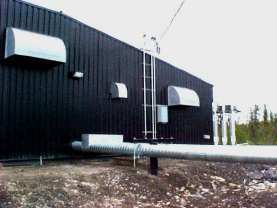 As it is a residential facility, the water heating requirements are much higher than a normal building because of the continuous need for heated water in the kitchen, bathroom and laundry.Hybrid systems work very well in the far north; the heat collected by the SolarWall system is first used to heat ventilation air, with the remaining heat going towards heating the water. This is designed to make the system very cost effective.In the spring and fall it is very cold outside, but also very sunny. During this time, the light reflects off the snow onto the wall, enhancing the performance of the SolarWall air heater. This more than compensates for the shortened duration during the day. In the summer when there is 24 hours of daylight and no need for heated ventilation air. This means that all the collected heat is used to heat the water.